Welcome to the March edition of our monthly travel bulletin. We’re now in a different season. For those in the northern hemisphere, spring has now sprung, while in the southern hemisphere summer has given way to autumn. Please let us know if these monthly bulletins are giving you new ideas and inspirations about travel. Our subscribers are definitely helping us with their feedback on what they really like and what they like less. This is certainly allowing us to target the bulletin to offer just what you would like to see. One suggestion that we’re following up on in this edition is that we’ve been asked to tell you more about some of our own favorite travel experiences. You can find this new section later in the Bulletin. As before, we want to offer our “thank you” to all those subscribers who have sent us messages. Please continue to let us know just what you’d like to see in future by replying to this email. Then we can continue to make each issue better tuned to your needs than previous ones. Many travelers have compiled a number of places that they realize must be a part of their life experience. This is often called their “travel bucket list”. This post summarizes two articles that provide travel tips directly related to travelers with very definite ideas about those special destinations. One of these articles covers the steps that a novice traveler will need to follow in order to compile a bucket list, and then to plan and book their trip. However, the second article goes a little deeper into the planning and implementation process in order to ensure that your special expedition meets all of your expectations and needs. Japan is an enigmatic destination with many different types of appeal, some of which appear at first sight to be contradictory. 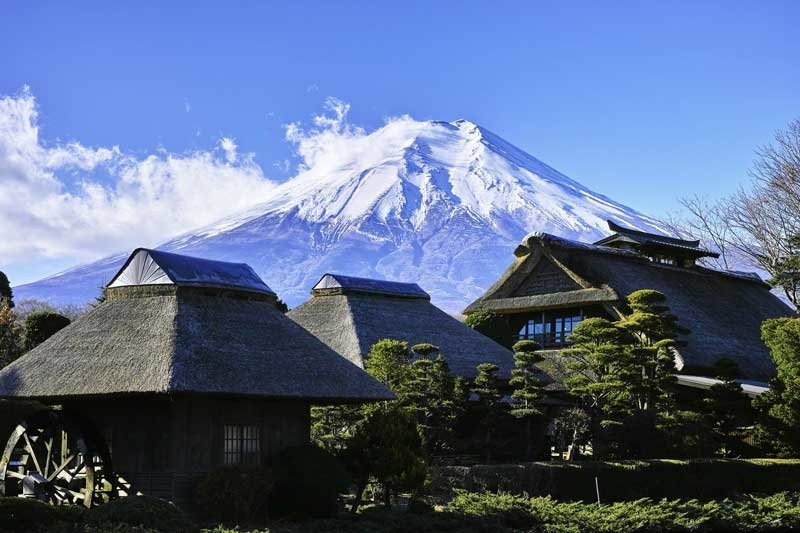 Here you will find ancient temples and avant-garde cities; traditional ramen houses and Macdonalds; scenic peaks as well as high-speed trains; cherry blossoms and plasma advertising billboards, and many others. While Tokyo, in particular, has been seen as a costly destination, many of these assumptions can be seen as exaggerated in today’s tourism market. Indeed, travel costs in Japan for tourists are today comparable with many countries in Western Europe, and indeed lower than New York or London. Food can obviously be expensive, but there are many eating places that offer pleasant and sustainable food at reasonable prices. Similarly, accommodation can cost as little as $20 per night in a dorm bed in a hostel to about $80 per night for a double room in a business hotel. However, international chain hotels are significantly more expensive, generally from $200 per night upwards. 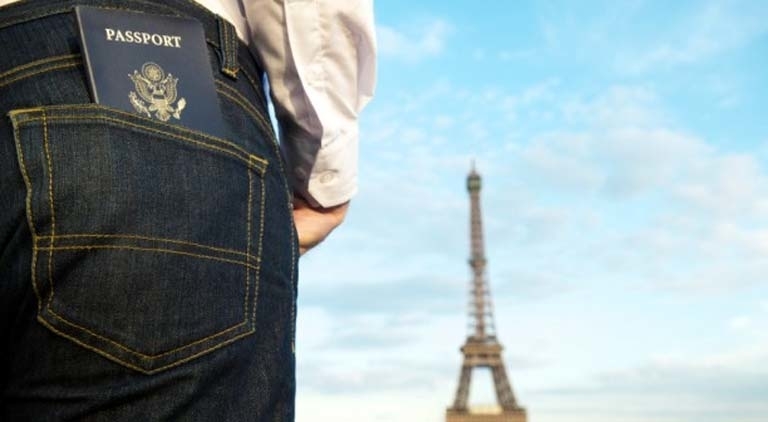 Now that the travel season is back upon us, remember that while traveling abroad you may be more at risk from crafty pickpockets and “con artists” than back home. 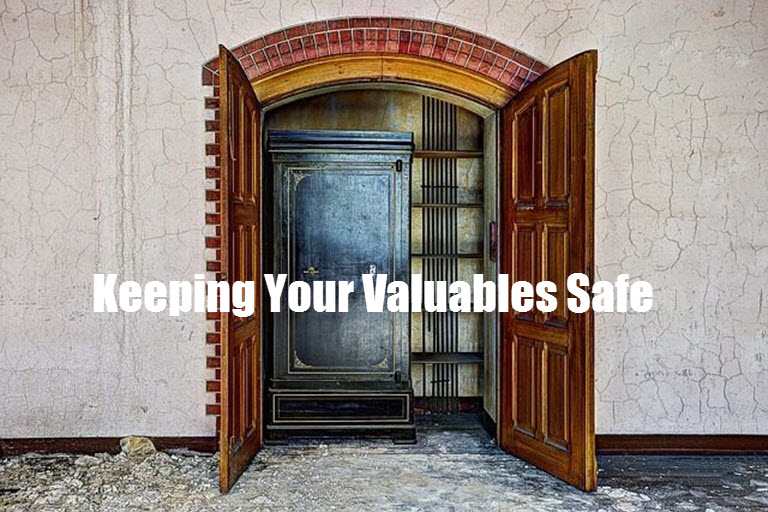 While away from home, you should be especially alert to protect yourself from anything that might seem a little odd. There are a number of ways in which unscrupulous people will try to part an unwary tourist from his or her money and possessions. These include: pickpocketing, counterfeit change, ATM skimming and many others. Always keep your critical items such as passports and licenses apart from your wallet or handbag to prevent their loss. Keep your cards in at least two locations so that you don’t lose them all in the case of theft, and keep information about how to report thefts with you so that you can cancel anything that you do lose. Travel News – European Visas For US Visitors? A recently announced call from the European Parliament may result in the need for American tourists to apply for a visa if they wish to visit Europe in future. This has been mooted in response to a refusal by the US border control to allow people from 5 European states to visit the US without a visa. While travelers from the other EU states are eligible for entry using the US visa waiver program, the US State Department claims that Poland, Bulgaria, Croatia, Romania, and Cyprus do not meet US security requirements. Only time will tell if this EU decision is ratified and, if so, what the impact on US tourism numbers into Europe may be. We visited Dubrovnik in September 2013, and stayed in this lovely part of the Adriatic for a week. We soon discovered that the topography of the Dubrovnik region is not what you would describe as flat – very little of the surrounding land seems to be on one level. Of course, the undulating landscape provides much more interest, but you need to be relatively fit to explore all that Dubrovnik has to offer. One of the most interesting landmarks is that of the Walls and Forts of Dubrovnik that extend along the seafront and surround the old town. These walls run for about 2 kilometres. During our stay, we enjoyed the ambience of the Rose of Dubrovnik apartment in the suburb of Lapad. 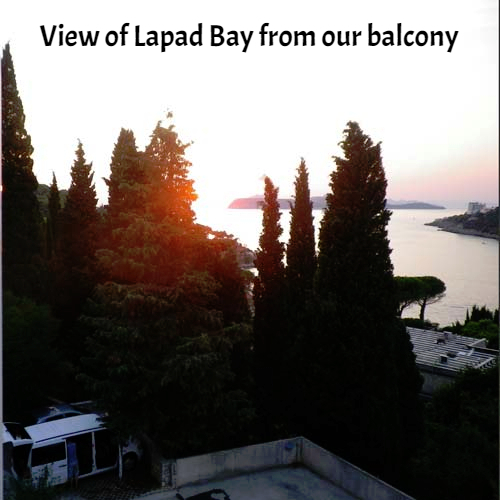 The view from our balcony was superb, looking down onto the tranquil waters of Lapad Bay and the adjacent pine forests. We loved our time exploring Dubrovnik and its surrounds, discovering the way of life in this southernmost city of Croatia and simply soaking up the atmosphere. 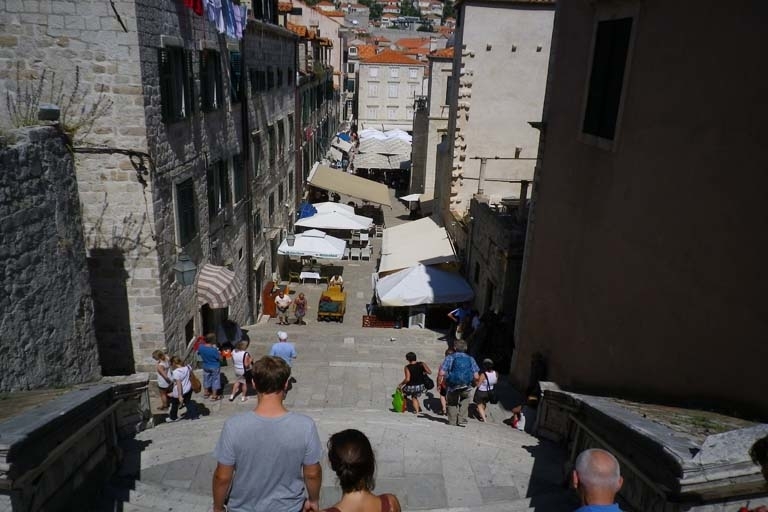 We certainly plan to return to Croatia on a future occasion, and to spend more time in Dubrovnik as well as other towns along the Adriatic coast.